Whether you have a substantial investment portfolio or haven’t started investing yet, you need to understand the fundamental building blocks of an investment portfolio. Keeping cash in hand to cover several months’ worth of your living expenses, if necessary, is a smart risk management and financial planning concept. You never know when a catastrophe may strike. A catastrophe affects many aspects of our lives, both personally and financially. In nearly every event, money is part of the solution — sometimes the only solution. Imagine how losing your job or having a new job fall through, not being able to sell your house, having a major medical bill, or having a sick child or pet would impact your financial life. The purpose of having access to money at very short notice is to protect you from risks you can’t afford to bear as best as reasonably possible. The Cash Reserve Options worksheet provided here gives you a listing of the common and not-so-common sources of cash reserves that you could consider in the event of an emergency. Check the box at the left if that resource applies to you, and then enter the approximate dollar amount accessible. Also notice in the right-hand column how quickly those funds could be available to you. 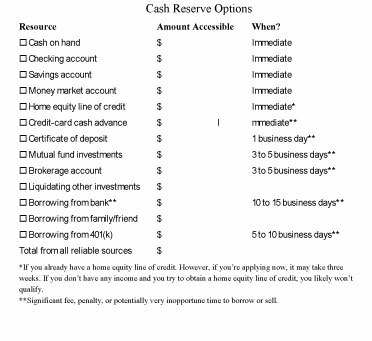 Click here to download and print the Cash Reserve Options Worksheet. Completing this worksheet helps you explore all traditional avenues for raising cash. The total sum represents how much money would be accessible to you in the event of an emergency. Now, open the Required Monthly Expenses worksheet. List your actual total monthly expenses. Then divide that amount by the total cash you could raise, from all reliable sources at the same time, to reveal approximately how many months’ worth of living expenses you can cover in the event of a catastrophe. How many months can you go without an income? 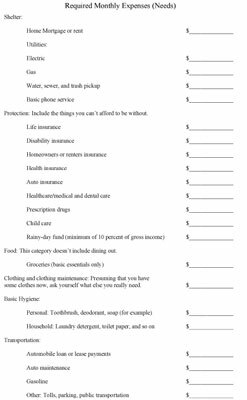 Click here to download and print the Required Monthly Expenses Worksheet. If you don’t have six months or more coverage, you need to build up cash reserves in the types of accounts that are accessible quickly, with little or no cost to access the funds. You may also discover that most of the money you can get your hands on would cost you substantially more than you’re comfortable paying or would potentially be very risky, and therefore decide that you need more money in safe, immediately available accounts. There’s no one “right” answer for everybody. If you’ve worked for the federal government for 20 years, your income is considerably more predictable than a real estate agent’s or a carpenter’s income. The stability of your job, your income, your health, as well as your tolerance for risk, must all be taken into account to determine the “right” amount you should have in cash reserves. If in doubt, play it safe!